"Consider the rising of the sun every morning as a personal invitation to make the most of each new day--an invitation to know and recognize the hand of the Lord in you life--an invitation to come and see, to continue the personal journey that will bring you closer to Christ. Respond, if you please." What a meaningful way to start each day and to have that perspective as you go about your day. Even on the bad days (especially on the bad days!). As I've sought to become closer to Jesus Christ over the last year, my feelings of happiness and inner peace have increased, and my spirituality and understanding of things that really matter have both deepened. I truly believe that staying close to Christ on a daily basis is one of the secrets to living a fulfilling life of peace and happiness. 1. I had to pick John up early from school yesterday because he had a fever, and he was home sick yesterday and again today. I'm pretty sure it's not the flu, but just another bug he picked up. This is the second time in less than a month that he's been sick. The rest of us have been healthy and I hope and pray that it stays that way. I'm determined not to get the flu, which is sweeping the nation badly this year. We don't get flu vaccines anymore. I'm one of "those people" who are wary of vaccines and we only get the ones that are absolutely necessary. May the force be with us! 2. After over a year of owning my current SUV, I figured out last month that it has a heated steering wheel. 🙌 I've been enjoying it just about every time I drive since then. Because, winter. 3. I don't have Facebook on my phone or iPad anymore. I'm always amazed by how much less I go on Facebook when I can only use the computer to go on it. I don't know why it amazes me so much; it makes sense and I've done this several times in my life before. Also, Donna, is it really that amazing? Come on. But I do notice that I feel more balanced and organized and focused without it always being nearby. I'm only going to have it on my phone when we travel from now on, and during our summers on the Cape because I don't have a computer there. I've said that all before but this time I really mean it! 4. I'm still in denial that we're probably moving this summer. See that, I can't even say that we're moving without adding a "probably" to it. Part of me really hopes that something will happen so that we don't have to leave our cozy home in the wonderful Midwest and our comfortable, familiar life and routines here. But then the other part of me would be sad and disappointed that we wouldn't be moving to Massachusetts after all. It's a confusing and stressful time for me, it really is. I just take it day by day, and live like nothing is changing. Hence, my denial and lack of full acceptance that things are likely going to be changing. I do know that when--IF--it comes time to sell our house that I won't be a motivated seller and our real estate agent probably won't like me very much. This is our house, after all, and no one else's! Ugh. If we do move I'm never moving again. 5. I found out about this movie The Nutcracker and the Four Realms last week. It doesn't come out until November and I can't wait! I'm a long-time fan of The Nutcracker, and Disney is doing the movie so you know it's going to be good. Check out the trailer, it might just blow you away like it did me! Dance of the Sugar Plum Fairy is my favorite song from the ballet and that's what the song in the trailer is. Saturday, March 18th, was a week to the day from when our magical cruise began. I guess technically the day you debark isn't a cruise day, especially because you leave the ship in the morning and the cruise was officially over for us by around 8:00 a.m. But still, it was part of vacation so it's worthy of documentation, however unexciting it might be. This was around 6:30 in the morning. The ship had docked and I watched for a minute from our balcony as luggage was carted off the ship. The Disney Cruise Line buses were all lined up and ready for the day's passengers who were coming (lucky!) and going (sad!). This is the building where the magic begins before boarding the ship and where it ends when the fun is officially done. Waiting for our taxi to pick us up and take us to the airport. 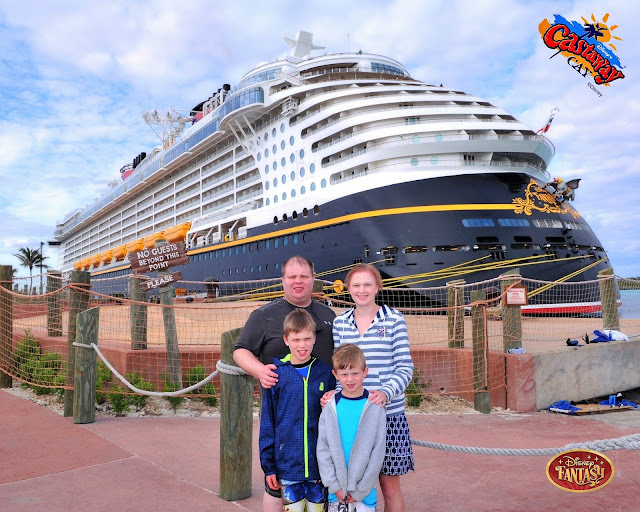 On our first Disney cruise, John was crying at this point, so this was a big improvement! Waiting (again) at the airport. We stayed outside of Chicago for the night because after such an early morning we didn't want to drive for four hours to get home. Peter took the boys to an indoor trampoline place and out to dinner and then to the hotel pool. I don't know how they had the energy for all that. I was exhausted. I stayed in the room, ate a bad microwave dinner, and read a book for the rest of the evening. Yesterday for dinner on the last night of our excellent cruise I enjoyed lobster bisque, delicious beef Wellington, and baked Alaska for dessert; tonight I'm eating crappy microwave pizza and Twizzlers in our hotel room in cold and chilly Chicago. What a difference a day makes! Sunday morning, before we left to drive home. And finally, home sweet home, this time for real! Sam fell right to sleep that night. I think we all did! It was another wonderful vacation thanks to the fantastic excellence that defines Disney Cruise Line. I hope these posts have convinced someone, somewhere, to go on a Disney cruise. And if I know you, even better. Then we can talk about it together!